Assoc. Prof. Supatra Kosaiyakanont, Acting President of RMUTP, award for best KM Website and best practice of the year 2014 to ARIT staff. 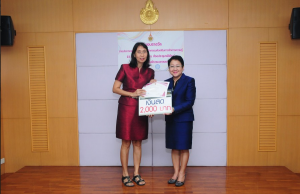 The event was held on September 3, 2014 at Rapheephat conference room, Office of the President, Rajamangala University of Technology Phra Nakhon (RMUTP).